Hashtags are so widely used now it is hard to explain the original purpose of them. This unique tagging helps categorize words into topics that can be linked to other Twitter users using the same hashtags. This grouping system facilitates interaction by sorting the links, making it easier for users to find posts with others using the same hashtag. This can potentially increase interaction between individuals around the world posting about the same topic. They can also create hype, therefore creating a new trending topic. According to the Twitter Support page, trending topics are determined by an algorithm Twitter uses based on the individual’s location and who the person follows on Twitter. Trending topics are not identified by what has been popular for an extended period of time but by topics that became immediately popular. If used correctly, a hashtag can be extraordinarily powerful. It cannot only create a hype, help advertisers promote a product, get people to interact and state their opinions, but also help individuals find information easily. According to “A new perspective on Twitter Hashtag Use,” an article by Hsia-Ching Chang, as Twitter grows and evolves, more people are partaking in sharing information and their opinions with the world and providing a like via hashtag. This practice is growing and evolving so fast it has expanded into other mediums. Social media sites like Facebook, Instagram and Pinterest have employed the use of hashtags. Television advertisements also have started to associate a specific hashtag with them as a way of prompting more engagement with viewers. 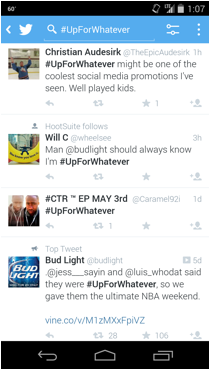 For example, #UpForWhatever was a hashtag used by But Light for a series of commercials where a typical guy named Ian is faced with a wild night full of fun and celebrities. This commercial was released during the Super Bowl and the hashtag was such a success it is still being used now. In my experience, the hashtag creates a sense of community. It allows interaction between individuals during live events, such as the Sochi Olympics, disasters like Hurricane Sandy and current news trends such as Major League Baseball games. Some individuals use hashtags as personal descriptions of what they are doing, what they’re wearing, in sarcastic messages or to express feelings rather than meaningful ideas. Spam Hashtags – Spam hashtags are when you add a hashtag before every word, for example, #Today #is #my #Birthday. This kind of hashtag is futile and has no concrete categorization in a search. Over-tags – This means hashtagging multiple subjects within one message. According to the Twitter help page and Best practices the recommended number of hashtags within one tweet is two. Any more than that will lose meaning and turn into an over-tag. Long and meaningless hashtags (#MyDogLovesEatingVanillaIceCream) – Somewhere around the world someone maybe posting about how much their dog loves eating vanilla ice cream, but this hashtag won’t link them to anyone else… unless by coincidence someone else is using it. Make sure you are getting the full potential out of your hashtags. Make them have meaning and a purpose. I found an article that helped me understand how to properly and effectively use hashtags by making them short and concise and limiting the number of hashtags in one tweet to two.